The Venezia Leather Attach" Case is an exquisite and elegant work of Italian craftsmanship. The Full Grain leather is molded around a solid wood frame, providing a beautiful finish. 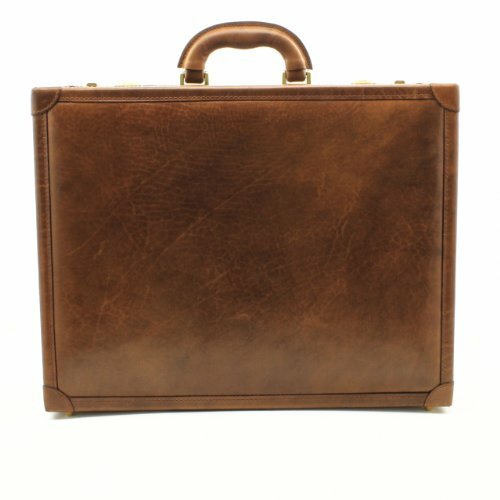 This midsize attach" case is ideal for anyone looking to exude professionalism and class, while still getting the most out of your case"it has ample space to fit a Laptop up to 15" and still carry all of your belongings. The rigid structure and robust closing mechanism ensure the contents inside the case are well protected. Top quality and superior hardware, features dual combination lock, sturdy and easy to open hinges, bottom legs for protection, comfortable and easy to grasp top handle. Corners are padded by a leather corner guard giving the bag a unique look. Attach" case features two adjustable document folders, cellphone holder, three business and credit card holders, and three pen holders. Dimensions: Exterior: 17.25"(L) x 13"(H) x 4.75"(W). Interior: 16.45"(L) x 11.95"(H) 3.85"(W). The Venezia Leather Attach" Case is part of our Tony Perotti Italico leather collection, made from Italian adult Bull hide Full Grain leather, providing a durable, stronger and longer lasting leather that is smooth to the touch with a shiny glossed finish. The cool Italian weather prevents any flea or tick irritation to the animals attributing to the top quality and purity of the leather, devoid of any scratches or bites on the leather. Tanned in a heavy coating of different eco-friendly vegetable oils to prevent everyday scratches and blemishes, the natural surface of our full grain leather burnishes and beautifies over time. Our Italico collection products come in a signature plaid interior lining for added style and fashion. Our Tony Perotti products are backed by a limited lifetime warranty. Please contact the Distributor Tony Perotti USA. Dual Combination Lock, bottom legs for protection, top quality frame and hardware. Sturdy and easy to open hinges. Easy to grasp top handle. Corners are padded by a leather corner guard to give the bag a unique look. Interior pigskin lining. Comes in lint bag for storage. Combination lock brochure included inside. Dimensions: Exterior: 17.25"(L) x 13"(H) x 4.75"(W). Interior: 16.45"(L) x 11.95"(H) 3.85"(W). Weight: 6 lbs. Comes with Limited Lifetime Warranty.